Successfully Added 10Watt Vape Mod Kit - 5-10 Wattage Range, Temperature Control, 1050mAh Battery, 1.0-2.0 Ohm Resistance (Silver) to your Shopping Cart. This remarkable vape mod kit features an adjustable output range that can reach a maximum output of 10Watt. Made from a stylish aluminum alloy, this E-cig features a durable design that can take a hit. Its small and compact size makes this E-Cigarette extremely portable – allowing you to simply slip it in your bag or pocket and carry it along wherever you’re headed. With a 1050mAh battery, this vaper offers hours worth of continuous usage time, letting you engage in relaxing and tasteful vaping sessions all throughout the day without ever needing to worry about running out of juice. Simply pour in your favorite taste of vaping liquid and you’ll be all set to enjoy the delicious taste created by this beautiful vape mod. Supporting manual temperature adjustment, this E-cig allows you to adjust its temperature to your exact liking - letting you take the absolute most out of your vaping experience. Simply use the buttons found on the vape mod and you’ll be able to instantly control its Wattage and temperature, ensuring that you’ll always have the right settings enabled that meet your personal vaping demands. Supporting a resistance of 1 – 2-ohms, this vape mod is capable of dealing with plenty of Wattage – allowing you to take great taste out of your liquid and to produce amazingly large clouds during your upcoming vaping sessions. Featuring a simple design, this E-cig is extremely easy to operate, making it the perfect vape kit for all the beginning vapers out there. All you have to do is proud in your favorite vape liquid, adjust the settings to your liking, and you’ll be all set to sit back and relax while enjoying your tasteful vape. 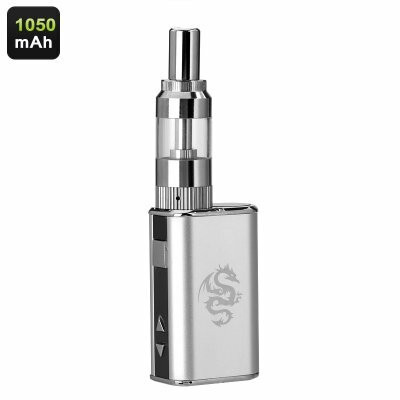 Added to the simple and sleek design, this E-cigarette comes another extra fun little feature which is the dragon logo that can be found on the vape mod itself. Changing color based on temperature, this dragon logo lights up in sunlight creating an extraordinary visual effect. From now on you’ll be able to grab the attention of all your friends and bystanders as, with this magnificent little E-cig, you are sure to steal the show wherever you’re at. This vape mod kit comes with a 12 months warranty, brought to you by the leader in electronic devices as well as wholesale electronic gadgets.. This product is not intended for people under 18 years old. Please keep away from it if you have heart diseases, high blood pressure, tristimania or you are in pregnancy or lactation. Intended for sale to adults 18 years or older. By entering this website, you certify that you are of legal smoking age in the state in which you reside.